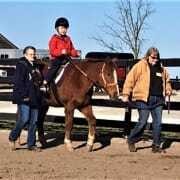 Therapeion Therapeutic Riding Center provides equine assisted therapies for persons with disabilities in Tippecanoe, White, and the surrounding counties. We are currently searching for two individuals to join our Board. Duties include, but are not limited to, attending one monthly meeting, actively promoting and supporting Therapeion's programs, and participating in our two major fund raising events each year. If you are passionate about supporting programming for persons with disabilities this could be your perfect opportunity to serve. Please contact us to learn more or to schedule a visit to our facility.